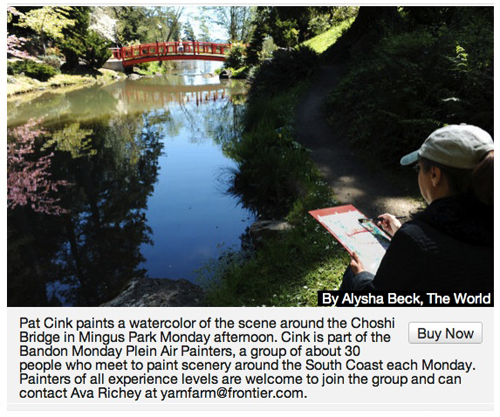 In June, Oregon gardens start to get showy with bright flowers. But this subdued potted succulent quietly absorbed the sun and my attention during a paint out at a friend’s garden. 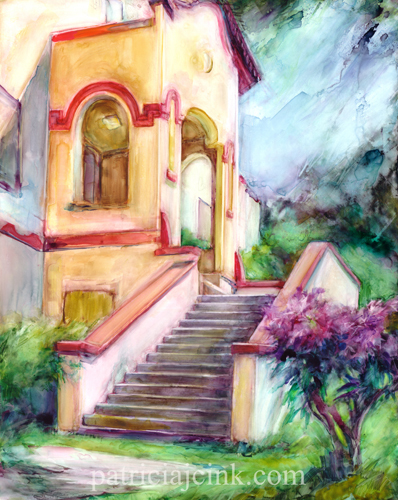 This elegant old Southwestern style building is located near Mingus Park in Coos Bay, Oregon. A sun speckled stairway, azaleas in full bloom and a covered entryway draw me in to imagining this old building’s stories. It was once a hospital and now sits empty waiting for its next chapter. I moved to the Oregon Coast wanting to paint the ocean and beaches. But I am finding many more incredible places to paint with this group of painters who know the area so well.